Description: Dark blue crown cap. Orange and cream label. Silver text: SPEIGHT'S Gold Medal Ale. Dark blue text: Pride of the South. Silver text in the contour: # 25501. 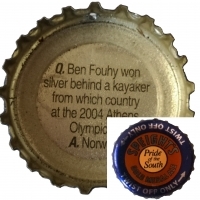 Black text inside: Q. Ben Fouhy won silver behind a kayakerfrom which country at the 2004 Athens Olympics? A. Norway.